Did you guys know about this? About the exciting concept of creating your very own yogurt from regular milk? For a while I knew vaguely of such a thing, but I always pictured something more Walter White than health-conscious housewife. Not so! Milk transforms into yogurt when it is exposed to certain bacteria, known on the back of a yogurt cup as “live active cultures,” that begin a fermenting process. All you have to do is take milk, warm it up and let those cultures loose! 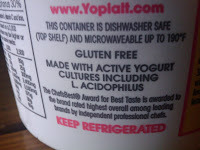 You can find these live active cultures in store-bought yogurt. As for the warmth, it comes from a crockpot (slow cooker), of course, formerly known around these parts for tasty ribs, pulled pork, mulled wine and spinach artichoke dip. The whole thing is pretty darn easy and just takes some time, though making yogurt to your exact tangy-ness and texture preference can take some experimenting. Remember that commercial yogurt contains pectin, gelatin or other thickeners so your yogurt will definitely be thinner than you’re used to. Strain it with some cheesecloth, paper towels or coffee filters to thicken it up without additional products. If you’re still not satisfied, blend it or bake it and no one will know the difference! If you’re a household of yogurt lovers with a slow cooker on hand, definitely give this a try to magically transform a half gallon of milk (about $3.50 for the organic stuff) into a half gallon of yogurt (usually at least $8 total). Those are some heck yes savings. Sweeten the stash with fruit, jam, honey, sugar or just about anything else. Keep it tangy for Middle Eastern marinades or dipping sauces. Lastly, don’t forget about frozen yogurt. Lastly lastly, enjoy. Jen Cantin graduated in 2011 from Clark University in Worcester, Mass. with a degree in English and Journalism. 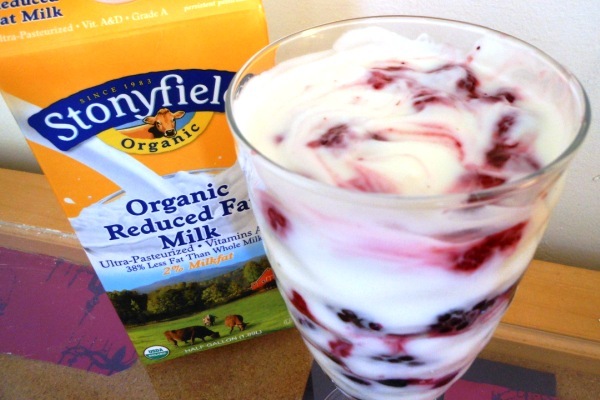 She shares other (a)musings at Deep Fried Epiphany and dedicates this post to the cows on the front of Stonyfield Farm stuff. Nice goin’, cows. I’ve tried very hard to find the answer to the question “what if bad bacteria (from unsterilized equipment) gets in your yogurt and you eat it?” without finding any information besides that other bacteria can make it taste “off.” Although I was *personally unable* to locate any documented health hazards, make sure you wash your equipment with hot, soapy water and air dry before use. And if it tastes funky, don’t eat it! Pour the milk into the clean crock pot and replace the lid. 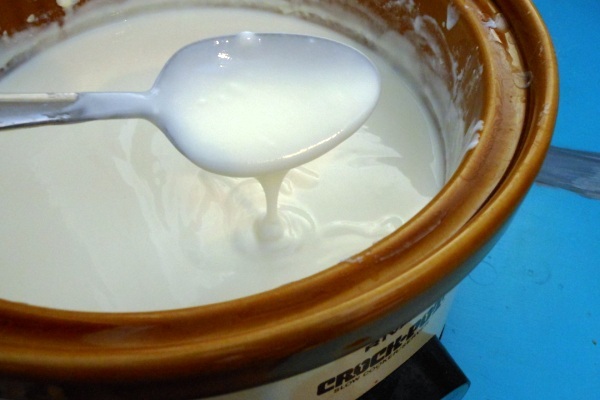 Turn crock pot to high and warm until milk is almost boiling, which is 180°F if you have a thermometer. If not, you’ll be able to see a little bit of motion from tiny bubbles in the milk. This kills existing bacteria in the milk and typically takes 2-4 hours. Once heated to almost boiling, turn off the crock pot and remove lid. Stirring occasionally, let yogurt cool until 115°F, or cool enough that you can dip your (clean) finger in and leave it for 10 seconds. Thoroughly stir in the yogurt and powdered milk, if you’re using it. Replace lid, unplug crock pot and wrap the entire thing (warming portion too) in a large towel. Let sit at room temperature for 8-12 hours in a draft-free environment such as the (cold) oven. Putting a note on the outside for others not to turn the oven on is a good idea, too. The longer you let it sit, the tangier it will be. It keeps in the fridge for about a week. Save about a cup of it to use as starter for next time! This looks great for making large quantities of yogurt. I am tempted to try it, although the idea of leaving it at room temperature for 8-12 hours sounds a bit weird. (My mom was a biochemist, so I may be overly paranoid about bacteria growing.) Any science-type citations for it being OK to leave milk at room temperature for so long? I totally agree with you about scientific citations. Like I said, I tried so hard to find any scientific cautionary warnings, but let me tell you, it doesn’t look like there are any! The process is that the bacteria eats up the lactose, so the longer it sits, it will just eventually be lactose-free, making it fully 100% “yogurt” ano no longer “milk.” 8-12 hours is on the longer side from what I’ve found, so you can try 4-6 if that makes you more comfortable. Definitely let me know if you can find anything else! This is really interesting, and I’d love to try it. Do you happen to know if it would be safe for pregnant women? Apparently I’m not allowed to make my own soft cheese while pregnant, so I might have to wait until the baby is born. But it sure sounds like something I’d enjoy making! I don’t know for a fact, but since you can strain yogurt to make “yogurt cheese,” which would be a soft cheese, I’d definitely wait. Sounds like your new baby is gonna be lucky to have a good cookin’ mom!